More than half of New York City's politicians are urging mayor Mike Bloomberg to rule out any attempt to bring in London-style congestion charge. The plea from city council members based in the two biggest commuter boroughs - Brooklyn and Queens - is based entirely on a recent retail survey by the London Chamber of Commerce. Just under half of the UK capital's respondents said the £5 ($8) congestion charge had hurt their business, with over a quarter saying that they were considering relocating outside the zone. Three-quarters of the businesses surveyed, added that the charge had not led to improved productivity -indicating that less congested roads don't necessarily lead to more efficient trade. The negative impact cited by the chamber of commerce, was gratefully received on this side of the Atlantic, by politicians who are anxious to stop a fiscally-challenged mayor from imposing more tolls and taxes on their voters. Mayor Bloomberg has made his environmental agenda clear with a personal crusade to ban smoking in bars and restaurants, and new daytime traffic flow systems in midtown Manhattan, designed to ease gridlock. But sceptics believe that his championing of fellow mayor Ken Livingstone's congestion strategy has more to do with the need to redress New York's chronic budget deficit problems than anything else. The finance committee chairman and council member for East Queens, David Weprin, led a press conference on the steps of City Hall on Tuesday, calling on the mayor to rule out any attempt to impose a toll on the eastern road bridges into Manhattan, which are currently free to use. He said: "The London scheme proves that congestion pricing, tolls, or any other fees that discourage people from coming into the city are a bad idea, and need to be taken off the negotiating table permanently." "What does or doesn't work for London, doesn't necessarily work for New York City," he added. "You're talking about a much larger business district here...the bad effects it's had on London will be magnified." Another council member, Eric Goia, cited his own father as an example of how much a congestion charge could cost the city. "A big part of my father's flower business is making deliveries to Manhattan every day," he said. Jay Rosario said congestion charging is a "rip-off"
"This is just another tax ramp," he claimed. "Another burden being put on him by city government, saying, it's too expensive for you to do business in this city." The councillors also invoked the 11 September attacks to support their argument. Since the destruction of the twin towers and subsequent loss of business activity in lower Manhattan, 100,000 fewer car journeys are being made each day. "Now is not the time to impose an additional hardship on our businesses," said councilman Weprin. Despite the general popularity of the congestion charge principle in London, New Yorkers taking their lunch break in the City Hall park did not seem to share those environmental concerns. Seven-million people commute into Manhattan each day to work, overwhelmingly by public transport systems that work better than the creaking Tube or privatised rail networks. 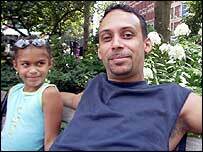 Jay Rosario is a Bronx resident who was "taking care of some business" downtown. He said: "The idea of another charge for New York drivers is a rip-off. The city's expensive enough already and it'll just hurt the poor-folks." Mr Rosario has got so fed up with the economic downturn and cost of living in New York, that he is relocating to Pennsylvania. 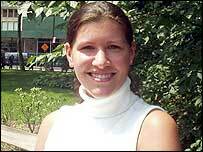 Denise Chimienti, 26, works for the Manhattan District Attorney's office and commutes in each day from Queens. "I don't really think there is a congestion problem here," she said. "People are going to drive into Manhattan because they have to. Another charge won't keep anyone away, though I guess the city could use the money," she added. A Wall Street banker sunning himself on a park bench, who identified himself simply as Marvin, was more emphatic: "I think it's a terrible idea. 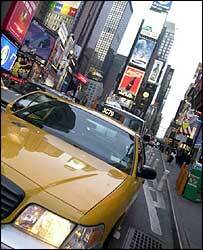 Congestion is an urban problem, not a New York problem," he groaned. "We're much better here than most, and slapping more charges on drivers is just another burden." The doubters here have a serious point. New York is a city that is better suited to the automobile, and traffic flows much more freely and efficiently here, than along the largely 18th and 19th century streets of London. Councilman Goia however, was prepared to accept that the Big Apple could do better. He said: "When you look at cities like Paris and London and Sydney, they have a far more advanced system of crossing their rivers than we do." He added: "One answer to the congestion problem here would be a fleet of high-speed water taxis, crossing back and forth."